Big plans for tonight? Per usual, Dan and I have not solidified anything yet. I am super excited to ring in the new year. This is the first time in many, many years that my New Year's Resolution isn't to lose weight. Not that I couldn't stand to lose a few more lbs, but because I don't need to make a big change for that to happen. If I continue living the lifestyle I live right now, I know those last few pounds will come off eventually. Instead, my NYR is something that I will hopefully benefit from for years to come - to be more organized. There are some areas of my life that are extremely organized. My email is categorized, sub-categorized, and sub-sub-categorized and my inbox never has more than 10 emails in it. Our budget is exceled beyond imagination. However, there are many areas that need life support. I have decided that instead of making the overall yearly goal of getting my act together, each month I will pick one area in my life to focus on and one new organizational habit to start. Additionally, I hope that when I organize each new area, I don't just put everything back in its original place, because obviously that system has failed. I want to think about how I use the space, what I can do to make it easier to use, and easier to keep usable. I know that if my life is more organized I will feel less stress and spend less time looking for that roll of tape in one of my many junk drawers or finding the cinnamon in my monster of a pantry. Area: junk drawers. My goal is to consolidate all of our junk areas. Yesterday I tried to count them and stopped at 10. Habit: make my bed every morning. There is something so refreshing about getting into a made bed at night. Area: pantry. 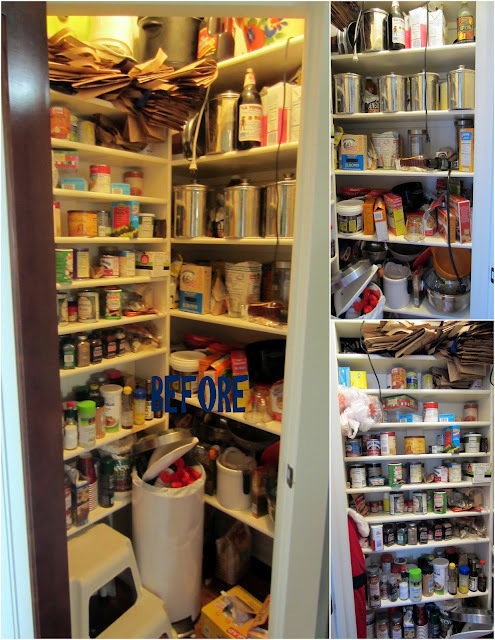 Getting my pantry more usable is going to take a lot of thought and planning. I am going to start pinning now. Habit: put all the dirty dishes in the dishwasher before bed. I despise waking up to make coffee and seeing/smelling dinner from the night before. Area: home office. This is our "junk room" so it will be a major challenge. Habit: Start the Roomba before I leave for work everyday. Area: my closet. This will be a great time to store all of my winter clothes and donate any spring and summer clothes I don't want anymore. Habit: don't leave clothes on the floor. They either go back in the closet or down the laundry shoot. Area: garage. Now, I know that my garage is a lost cause due to Dan's picking habits. However. I want one wall to be organized with stuff we actually use like a hammer, measuring tape, and a screw driver. Habit: organize iPhoto at least once per week. Right now it is once per 4 months and it takes hours! Habit: bathe dogs every other week. Area: kitchen cabinets and drawers. My goal is to be able to open a cabinet without the risk of something falling on me. Habit: return things that are borrowed in a timely manner. Right now I still have the maternity clothes I borrowed from people over a year and a half ago! Yikes! Area: laundry room. This room is relatively organized right now, but who knows what 8 months will bring. Habit: start a load of laundry before bed. This way it won't pile up to the ceiling and I can fit clothes down the laundry shoot. Area: work office. I better not say anything else on that one. Ha! Habit: log my work hours daily instead of monthly. Area: bathroom. In other words, throw away the 20+ razors that Dan keeps in the drawers. Habit: put everything away after I get ready every morning. Area: Ina's toys. This will be right before her birthday and Christmas. Best to organize and donate before the next wave comes in. Habit: Start to teach Ina to clean up after she gets done playing. How early is too early on this one? She will be 2 by then (crazy to think about!) so I hope she will start to understand the concept. Area: holiday storage. Hopefully I can clear out what we don't use anymore without Dan digging everything out of the trash. Habit: write thank you cards within one week of getting gift. I still haven't written thank you cards from Ina's birthday. Shame. Does anyone want to join me? Can anyone think of a habit or area that I have obviously missed? I love this. It's always a goal of mine to get organized but gets overwhelming. I like your idea of monthly goals! Thanks & happy new year! P.S. have you read the blog iheartorganizing.blogspot.com? It is amazing but will def make you feel worse... Lol! I like your monthly goals & habits, I may try some! I love this, I'm going to attempt this too. I also need to tackle our basement, but I don't have an office at work so I can do that month instead.